As a linguist, you obviously have a fascination with words and usage. However, a style manual seems like a new path for you. Was there a moment that made you throw up your hands and say, “I need to write this book”? Actually, I’m a psychologist—in defiance of the rule for English compounds, a psycholinguist is typically not a linguist but a psychologist, one who studies language. Though I had long mused about writing a style manual based in psycholinguistics and cognitive science, the last straw was dealing with a copyeditor who took reasonable rules of thumb, like avoiding passives and sentences that begin with There is, and applied them robotically, making a hash of my prose. I realized that many editors don’t understand the rationale behind the traditional guidelines and so are ill equipped to apply them judiciously. Clearly there was a need (yes, “therewas,” dammit!) for a manual that explained the reasons behind common rules and guidelines rather than just stipulating them as commandments. You talk about the “curse of knowledge,” how writers get in trouble because they can’t put themselves mentally into the place of readers who may know less. The two remedies you suggest are to run your writing by a friend or colleague, or put it aside and read it fresh after time has passed. Do you have any tips for a writer or editor on deadline who doesn’t have time for either? Remembering the readers over your shoulder, getting into their heads, seeing the world from their point of view, feeling their pain, walking a mile in their moccasins, and other forms of empathy and perspective taking (perspective-taking?) [Our style is to omit the hyphen.—Ed.] are the next best things. The reason that they are usually not enough is that we’re not as good at these forms of telepathy as we think we are. What’s obvious to us may not be obvious to anyone else. You write that spoken conversation is instinctive and that we have used it since our earliest cultural beginnings, but that “the written word is a recent invention that has left no trace in our genome, and must be laboriously acquired throughout childhood and beyond.” Does this explain why we constantly argue over grammar rules but aren’t as critical about speech rules? I think the problem is more that written language lingers on the page for everyone to see, whereas speech is evanescent and the exact wording evaporates from memory quickly. Readers can often tell when a sentence feels “off.” Is there a cognitive explanation for this? Many flaws in a sentence can ping our linguistic radar. A grammatical violation that would scream out in a simple sentence can pass almost unnoticed in a complicated one, such as the agreement error in The impact of the cuts have not been felt yet. A sentence can contain a mini-malaprop which may not be immediately obvious, as in The actress was an unexceptional (rather than unexceptionable) choice. Sometimes the “correct” version of a construction can grate on a reader’s ear, such as He’s one of those men who are constantly complaining about their jobs, suggesting that the relevant rule may be more subtle than copyeditors realize. (In this case, we should reexamine the rule stipulating that the verb in a relative clause introduced by one of those who must agree with the downstairs subject who rather than the upstairs subject one). And sometimes a sentence may contain a garden path: a sequence of words which leads the reader into parsing the sentence incorrectly, such as one that tripped me up this morning: U.S. Secretary of State John Kerry arrived in Baghdad on Wednesday to endorse the new Iraqi government hours before President Barack Obama will address the American people about his strategy for combating ISIS militants. I first thought that Kerry was endorsing the government hours, as if they were like bankers’ hours. You make the argument that writers should be mindful of the reasoning and exceptions behind modern language rules not only to perfect their writing but to defend their writing against blanket “blue penciling.” Our copyeditor readers might like to know whether you think editors can benefit from the same understanding and use it when arguing for editorial changes. The answer is yes, absolutely! For one thing, informative marginalia from a copyeditor is (are?) one of the best ways for writers to learn to write—I have benefited enormously from the explanations provided by my long-time copyeditor, Katya Rice. Also, copyeditors who have to justify their advice may be forced to rethink it—every now and again, I persuade Katya that a standard rule may not be correct as commonly stated. How would you respond to someone who’s belief in a grammar superstition (for instance, the prohibition of the split infinitive) is based in its divergence from Latin grammar? Pinker: Never mind the split infinitive; how should I respond to a question from The Chicago Manual of Style that includes the word who’s? This understandable slip illustrates an important fact about style. Though the point of my book is to champion the rationale behind rules, I also acknowledge that English contains a lot of brute irregularity: rules that make no sense but that got locked into the language and that we all have to live with. (After all, if the genitive of Sue is Sue’s, why shouldn’t the genitive of who be who’s? But it isn’t.) I like to think that being mindful that certain rules are irrational may be a good way of remembering them. The strange case of whose (and more generally, the absence of apostrophes from genitive pronouns) also reminds us that writers who make errors are often not being irrational. They’re being all too rational, while neglecting the niggling details of the printed page. As for Latin grammar: “Everything is what it is, and not another thing.” English is English; it isn’t Swahili, or Japanese, or Yiddish—or Latin. We’re curious: you provide quite a varied, interesting selection of examples in The Sense of Style. Some demonstrate excellent writing and others show muddled prose. How did you cultivate such a sampling? Do you collect favorites over the years? I keep files (electronic and paper) with linguistically interesting cartoons, song lyrics, quotes from politicians, and other usages, and when I decided to write The Sense of Style,I began to collect examples of wretched prose. Fortunately, I’m an academic, so I had plenty of material. 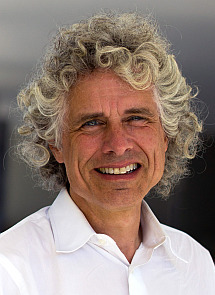 Steven Pinker is Johnstone Family Professor in the Department of Psychology at Harvard University. He is the author of ten books, including The Language Instinct, How the Mind Works, The Blank Slate, The Stuff of Thought, The Better Angels of Our Nature, and most recently, The Sense of Style: The Thinking Person’s Guide to Writing in the 21st Century.